"From C�zanne to Van Gogh: The collection of Dr Gachet"
Paul Gachet has become well-known for being the doctor who treated Vincent van Gogh in the final months of his life. It was no accident that Vincent came into contact with him as Gachet was friendly with a great number of artists whose work he collected and was an amateur painter himself. Van Gogh got on well with his doctor; the two men became friends and sometimes worked together. 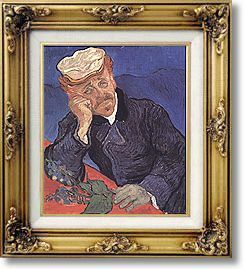 The portraits which Van Gogh made of Gachet have become world famous. The doctors son, also called Paul, donated a large part of his inheritance to the French state. Now, fifty years later, the R�union des Mus�es Nationaux has mounted this exhibition to show their gratitude. Before coming to Amsterdam the show will be on view at the Metropolitan Museum of Art in New York. A large number of these donated works can be seen in this exhibition, complemented by items from other museums and collections. Interesting exhibits are the copies made by father and son Gachet and their friend Blanche Derousse after works by Van Gogh. This shows clearly that the painter was greatly appreciated after his death. Seeing as Gachet made many copies of Van Goghs work, the suspicion has sometimes arisen that some works now attributed to Van Gogh were actually painted by the doctor. However, if Gachets work is compared to Van Goghs it is clear that the doctors skills would not stretch to producing perfect copies or forgeries. Recent scientific studies have also added extra weight to the argument that the works in question are not by Gachet but by Van Gogh himself.